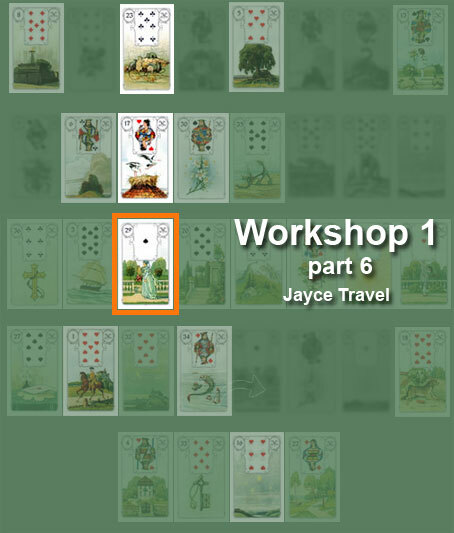 This is the 6th post about the workshop dedicated on the topic of the Grand Tableau. The Querent’s card is located in house 19, the house of the Tower. The Queren’t card has 2 cards above itself : the Storks and the Mice. The Storks’s keywords are : change, flexibility, evolution. The Mice’s keywords are : stress, worries, exhaustion, nervousness. The Mice also diminish the meaning of the surrounding card. The Mice is in the house of the Ship, in house 3. And the Storks is in the house of the Whip, house 11. The Mice in combination of the meaning of the 3rd house (the Ship) is speaking of a difficult transition. The desired change is not taking place easily.